1930s Craftsman Bungalow. 3 bedrooms, 1.5 bath, living room, eat-in kitchen, 31ft. brick porch, original shiplap wood siding, laundry room, unheated storage closet, large (inaccessible) attic space. Original hardwood floors, moulding, bead board ceilings, doorframes, mantles, coal fireplace (inoperational), built-in china cabinet, farmhouse sink, clawfoot tub, cast-iron miniature tub. 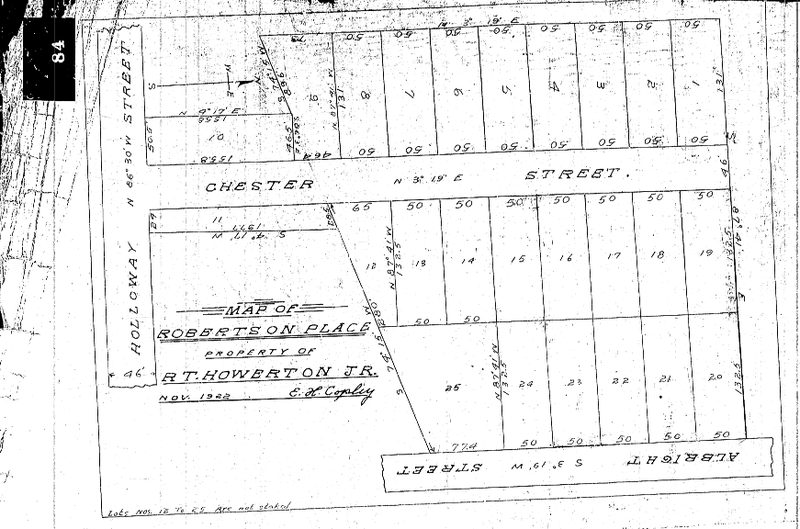 Lot (#15), was part of Robertson Place, owned by funeral home owner, R.T. Howerton, Jr. and surveyed by E.H. Copley as of November 1922. Note that the map names current N. Hyde Park as Albright Street. The city directory first lists the house in 1929 and notes it as "Vacant." In the 1930 US Census it shows a farmer, Henry W. Bryant, age 69, and his seven-person family as living here, and lists rent as $20 per month. Bryant never shows up in the city directory at this address, though he shows up at other addresses in Durham, including 408 Smith Street in the same year (1930). Following this, the 1931 city directory shows a different person, William C. Newton living there for the next few years, but never mentioned ownership of the house. Elvin H. Ferguson is listed at 1000 Chester Street first in 1938, and the 1940 US Census shows 28 year old Elvin H. Ferguson living there with his wife Rebecca and her 67 year old father, William A. Davis. They are listed at 1000 Chester in the 1944 city directory. Current owners Benjamin Filippo and Alison Rudel purchased home in March 2012 from Ronald E Burgess. Ronald and his wife, Iris, purchased the home in 1982 from the Stanley family. Willie Robert Stanley died in Durham in 1971, though no other records on him have been found in Durham. It seems from the deed that he was the owner and that his children sold the estate after the death of their mother. Ben & Ali are busy making cosmetic changes to the interior of the home, mostly in an effort to restore the home to its original state. They have painted most of the rooms, removed damaged wallpaper, removed faux wood paneling, removed carpeting to expose the original hardwood floor, removed drop ceilings and tiles to expose the original bead board ceilings, added countertops, added cabinets matching the original cabinetry, installed a 1953 Chambers stove in the kitchen, update plumbing to install a showerhead in the second bath and a washer and dryer in the laundry room. They have also pulled the plywood off the gable at the top of the house, exposing a rotted window, in order to gain access to the attic. The attic was empty, and even from inspection inside there does not appear to be an attic access in the home, though it is high enough to stand in in parts.